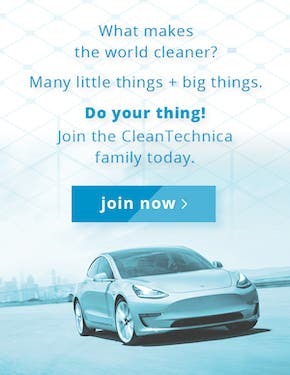 If you ask people today if cleantech is exciting, they will most likely not care or, if part of our cleantech bubble community, they will say “yes” and start shouting out “Musk, Tesla, SpaceX, Mars, Musk, Tesla … (yeah, I know SpaceX is for space travel not cleantech, but you know, Elon, Tesla, Musk, SpaceX…). 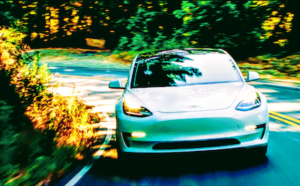 The trouble is, Elon Musk has no rivals. I mean, business-wise, there is a long list of competitors, but in terms of popularity, he seems somehow unchallenged. Rivalries have always inspired rivals themselves, but also the watchers, the ones who supported one or the other, and I am talking about it in the positive sense of urging people to do more, do better, or just do. History is full of examples of such epic rivalries. We could start with the obvious here — that is, Edison and Tesla. No Facebook, no Twitter, no TV — these guys battled in old-school ways, going as far as electrocuting animals to prove their point, and the world watched in awe. How about Jobs vs. Gates and the decades-long dispute over which approach was superior. I have friends who still take it seriously and are ready to fight for Apple’s “betterness.” In music, we had Prince and Michael Jackson producing hit albums one after another to the great satisfaction of global audiences. There are plenty of examples in sport — Messi vs. Ronaldo, Federer vs. Nadal, Muhammad Ali vs. Joe Frazier, etc. I won’t even mention Coke and Pepsi, as that’s too obvious — oh, well, I just did. The only possible matching rival for Elon Musk seems to be Jeff Bezos, but he is just competing in space exploration and perhaps simply business in general, and I don’t think he is interested in a rivalry anyway. 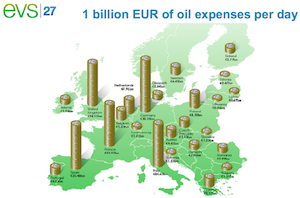 So, we need to look elsewhere for cleantech rivalry. I think I have found one that, keeping all proportions, may evolve into something interesting. The men to battle are Michael Liebreich and Tony Seba. It seems the battlefield is Twitter and the guns are future projections. The great thing is that both have many admirers, but many are different and many mutual ones admire them in different ways. Both are successful, but in different ways. Finally, both predict the future, but using different tools and approaches. Isn’t it great? I must say, I love Twitter and I am sorry it took me so long to actually start using it — concise, direct, unforgiving, and you get to choose the actors. 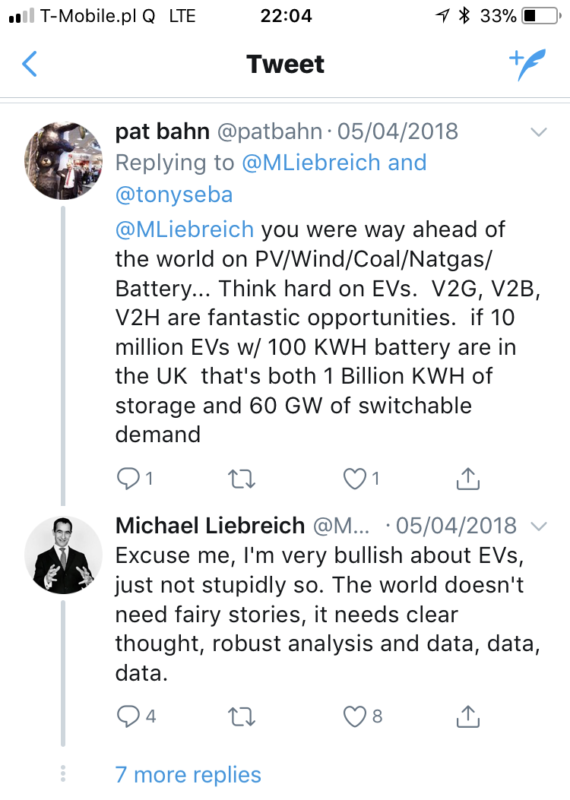 One day in early March, I was doing my regular Twitter check-in when I came across this wonderful entry by Michael Liebreich (and when I said twitter was unforgiving, I meant Michael, so please think twice before you tweet the man 🙂 ). Did I say Michael was unforgiving? People are generally careful in their tweets, unless they are Polish politicians or Donald Trump, and then nobody is safe, but here we can watch straightforwardness in its purest form. No beating about the bush, no “the man” or “a certain futurist” or some other BS — simply a punch in the jaw. Was I taken aback? 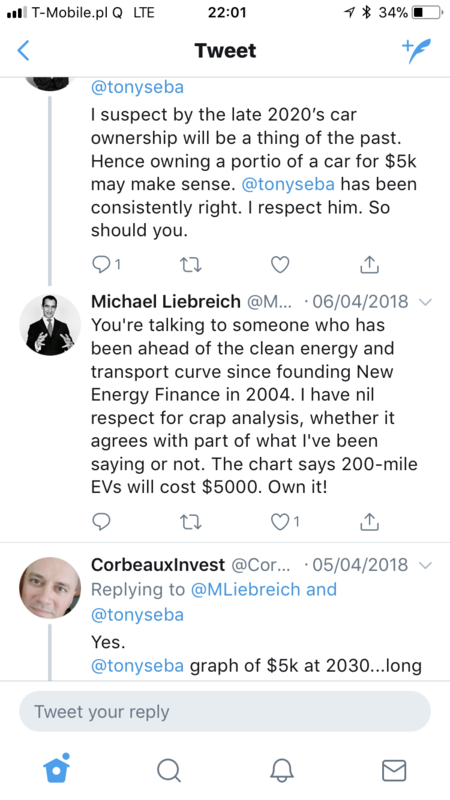 Yes, a bit, but having followed Michael Liebreich for some time by then, I knew it was exactly his style and he meant what he tweeted. It just made it more exciting and I felt we were in for a real fight. No reply from Tony Seba followed, unfortunately. However, it was early March and I was just about to go to Amsterdam to attend the rEVolution 2018 conference put on by EVBox. Guess who was a keynote speaker there? No one other than Tony Seba. 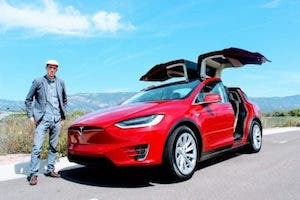 Guess who was another key speaker there — Colin McKerracher from BNEF (just a slight connection with Michael there). I felt a nice confrontation was coming and I wasn’t disappointed. There we were, in Amsterdam at the rEVolution 2018 conference, wondering how the two approaches would mesh on the same stage. So much has been said about this great event and will be said about it in coming articles that I am not going to dig much into the presentations here. All I will say is, don’t miss it next year! Anyway, Tony Seba was at the beginning of the day with his famous presentation about clean disruption and his predictions for transportation in 2030. See the presentation for yourselves if you have a moment, and then make your own judgments. That’s not what I am focusing on here. 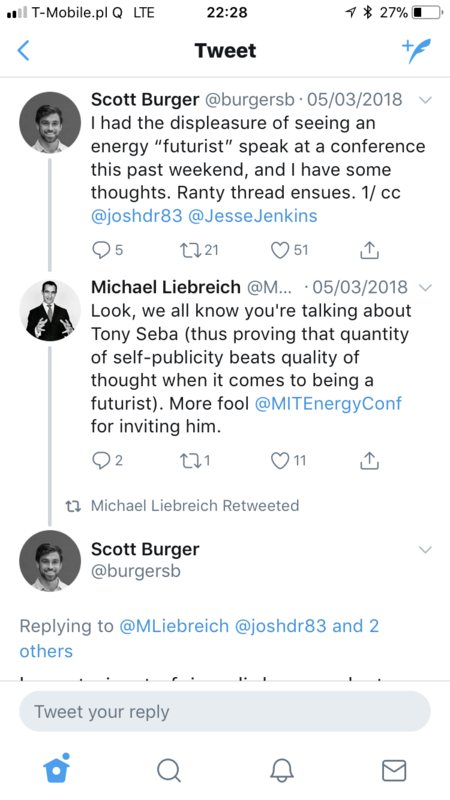 The question was why BNEF’s numbers were 3x lower in 2030 than Tony Seba’s numbers. 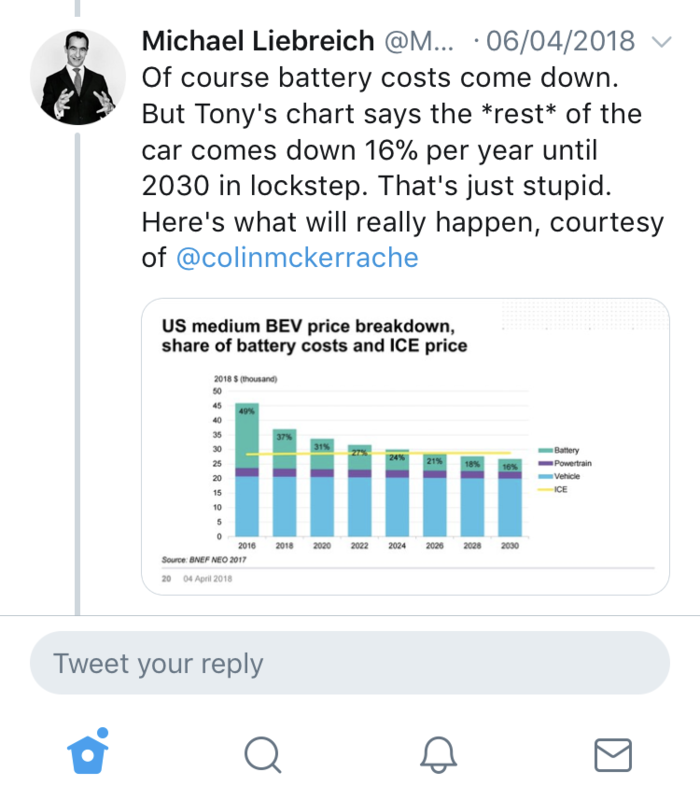 Colin first joked with a simple, short, and perhaps snarky answer — “different business models.” He went on to point out what he considered to be certain “mistakes” in the assumptions Tony makes, especially in the EV cost curve. Now, in this second act of the story, the clash of two different approaches to predicting the future became clearer than ever. I want to believe Tony is a gifted, intuitive futurist, and he has proven it before. 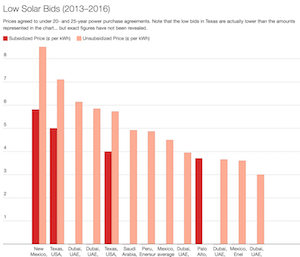 I also respect a lot what the BNEF team is doing every day to make sure we get a better understanding of what is happening in the energy market, relying on solid data, shrewd minds, and hard work. Tony was cornered. Could that be the end, then? Of course not. There was more to come.